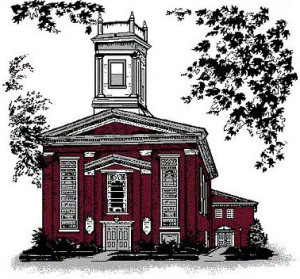 The Belvidere United Methodist Church had its beginnings when the first Methodist services in Belvidere were held in 1786. Pioneer preachers of the Methodist Episcopal denomination held services in various homes as early as 1810-1812, but a church was first organized in 1825. At the first meeting of the first Board of Trustees, which included Rev. George Banghart, called for the election of trustees, a resolution was adopted that the new organization should be known as “The Trustees of Wesleyan Chapel of Belvidere”. A certificate was filed in the office of the County Clerk on August 8, 1925, setting forth this fact. Services were held in The Wesleyan Chapel, whose cornerstone was laid in 1826. A brick structure with galleries at the sides and on one end with a high pulpit common to the churches of that period was built north of the railroad bridge, facing south, at the corner of Market Street and Delaware Avenue (the church graveyard can still be seen there today). It had two aisles, two front doors, and seated 300 persons. The men sat on the right side of the sanctuary and women on the left, as was the custom of those days. Two wood stoves provided the heat. This was the first house of worship in Belvidere and the fourth Methodist Church in Warren County. Circuit riders from the Philadelphia Conference served the “little church on the hill”, as it was known. Rev. William E. Perry was the last minister appointed to the circuit and served from 1838-1840. The first regularly appointed pastor, Rev. Vincent Sheppard (1840-41), assumed his duties in 1840. He was followed by Rev. Joseph Chattle (1841-43), Richard Lanning (1843-44), Edmund Hance (1844-45), John Scarlet (1845-47), John Townly Crane (1847-48). Previous to 1827, public worship has held in private homes, although many of the inhabitants attended services at the “Old Oxford Meeting House” or at Knowlton Methodist camp meetings were held for several weeks every year in Butler’s Grove which, in the early days, reached to the outskirts of the town. They were held elsewhere in the county when the woods were finally cut off. Growing Pains 1840s-During the 1840s, the original building was deemed inadequate for the needs of the congregation.According to early accounts, a controversy over the location of this new church in 1847 presented the congregation with many problems. Tensions were magnified by rivalry between the north and south sides of town. Members of the congregation which lived on opposite sides of the Pequest both wanted to have the church built on their side of town. As an inducement to locate the new church on the north side, Theodore S. Paul offered to present the trustees with a lot of land on Market Street where the Second Presbyterian Church was later built. The members who lived on the north side of town agreed that this was the ideal place for the church to built. Dr. J. Marshall Paul agreed to supplement the gift with a contribution of $200. The Hon. Garret D. Wall, in laying out the town plot on the south side of the Pequest had set apart three lots facing the public square for church purposes. He offered the church its present site on Hardwick Street opposite the park. Several members knowing that the town would eventually expand to the south, advocated to accept the Wall lot. It was then decided that this lot was much to far to one side of the town and they decided to look into purchasing a lot on the corner of Mill and Front Streets. After debating the issue, the trustees in 1848 decided to demolish the old church. At this time to keep the trustees from changing their minds the pastor, Rev. David Graves (1848-1850), assured commitment of the trustees to the new church project by starting to knock down the walls of the Wesleyan Chapel the morning after a decision was made to demolish it. He was joined by several members of the congregation, and in short order, the structure was razed to the ground. Contributions came from all parts of the county. In July 1849, the corner stone was laid with ceremony. On August 29, 1850, a deed was given by Peter D. Vroom and James W. Wall, trustees appointed by Garret D. Wall, for a lot 100 feet front by 192 feet deep, to be used for church purposes only. The main audience room (sanctuary) was not completed until 1855. The service of dedication finally took place on January 7, 1855 (Rev. George Winsor), by Bishop Janes, who delivered an address in the morning, while Rev. J. K. Shaw preached in the afternoon and evening. Following Rev. Winsor’s pastorate was Rev. E. M. Griffith (1856-58). Under the Rev. A. M. Palmer (1858-60), the new brick parsonage was erected (1860) on a lot adjoining the church. He was succeeded by Rev. George B. Day (1860-62), Thomas Walters (1862-64), Charles Snyder (1864-65),and Thomas Landon (1865-67). Growing and Expanding!1868 was the beginning of a revival…September 8, 1868 (Rev. J. Reeves Daniels, 1867-70), was the beginning of a revival which brought 175 new members into the church. The trustees decided that the sanctuary was too small, and voted to extend it 25 feet. A recess 4 feet deep and 15 feet wide wads built. This added 40 new pews and three new classrooms. With its completion, the church was reopened on Sunday, July 4, 1869, when Bishop Janes preached a discourse from Matthew 5:13-16. The cost of this extension was $5,500 of which $2,000 was raised that day. Rev. Benjamin Kelley (1870-73), John I. Morrow (1873-76), Richard Johns (1876-79), C.S. VanCleve (1879-82), John O. Winner (1882-84), Solomon Parsons (1884-87), Edwin N. Crasto (1887-90), William R. Kiefer (1890-93), A.L. Wilson (1893-98). The sanctuary was equipped with new pews and cushions in 1902 during the pastorate of Nathaniel Brooks (1898-03). Following, in 1904 when Dr. G. C. Moulsdale (1903-08) was minister a two-manual organ was installed. Finally in 1905 the mortgage was liquidated. From 1902-1913 additional furnishings and facilities were added to the church including 10 stained glass windows. In 1923 the windows were completed. Following Dr. Moulsdale, was Dr. William J. Hampton (1910-15). It was during this time that the beautifulmemorial stained-glass windows were installed in the main audience room made by G. E. Paddock and son (1911). These windows depict different stories in the Bible. During 1912, the Sunday School rooms in the basement were furnished with metal ceilings and new carpet. This is also the year that brought in the installation of electric lights to the church building. In 1913, the Ladies’ Aid Society rewired the church and installed new electric lighting fixtures. They also published “A Cook Book Containing Thoroughly Tested Recipes”. The recipes were “contributed by Many Friends of the Methodist Episcopal Church of Belvidere, New Jersey”. (Where much of this history was taken) Dr. William S. Robinson (1915-17) was the minister until 1917. Rev. William C. James (1917-26) was the minister in 1926 when the sanctuary was redecorated and memorial stained glass windows were installed in the vestibule. The centennial celebration in 1926 was celebrated and featured a week of special programs and the printing of a church history. Church School & more renovations…Members of the congregation contributed more than 10,000 hours of volunteer labor on construction of a new educational unit which is still in use today.The church school was organized in 1812 and met for more than 100 years in the basement of the church and the sanctuary. In 1955 (Rev. Elbridge T. Holland), the Official Board decided to construct a new educational unit. Members of the congregation contributed more than 10,000 hours of volunteer labor on this addition, including laying the floors, installing rock lathe, providing cabinets and finish work, and installing window glass. Trusses for the roof were made by men of the church from large beams obtained from a barn which was donated by Homer Hicks to the church for this purpose. In charge of the building and volunteers was John Heinrich from Broadway. Volunteers then gathered to construct drapes for the classes. During the period from 1946-1949, Rev. William F. B. Rodda’s pastorate, the sanctuary was completely renovated. Instead of a chancel which emphasized the choir and organ, a divided chancel was constructed with the altar replacing the organ pipes in the center with choir lofts on either side. At the same time, new furnishings including altar, pulpit, lectern, baptismal font and choir pews were installed. A new electronic organ was also installed to replace the aged pipe organ. New light fixtures were placed in the sanctuary featuring both indirect and direct lighting. These replaced old heavy fixtures that could be raised and lowered to light the candles. At the same time, the color scheme in the sanctuary was changed by using three-tone green paint on the walls and ceiling with the backs of the varnished pews painted a gloss white. Beautiful! During the period from 1955 to 1976, the time of our 150th anniversary, many additional improvements were made in the church building. These include the replacing of the old church school rooms by a fellowship hall and modern kitchen, the installation of an Allen electronic organ, a complete remodeling of the parsonage, and the covering of the church and parsonage exterior with brick facing. At the time of building the educational building, a new furnace for heating both the church building and the new building was installed. The 150th Anniversary was observed with a year-long celebration. General building upkeep at both the church and parsonage has been continued over the years. In the late 1980s, the sanctuary was repainted and the industrial-type windows in the educational building were replaced with vinyl windows. Through the courtesy of the son of one of our members, new lights were installed to illuminate the front window of the church. Exterior lights were also rejuvenated. A new sound system, a memorial to Howard Ryer by his wife Irma, was installed. Lawrence and Mabel Rasely donated ceiling fans in memory of their daughter Nancy Berryman.